Our 3D CAD Design capabilities cover all aspects of your product development process with a seamless, integrated workflow—design, verification, sustainable design, communication and data management. Designers and engineers can span multiple disciplines with ease, shortening the design cycle, increasing productivity and delivering innovative products to market faster. We can import/export to a wide variety of other formats including STEP, ACIS, JT, IGES, STL, and Parasolid. 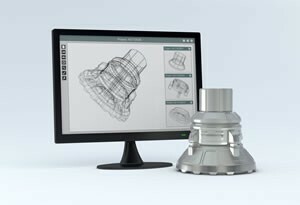 It’s our mission to help you quickly transform new ideas into great products, regardless of the 3D CAD tool you use. Given our manufacturing heritage, we understand how to design parts that can be produced with the utmost precision and consistent quality. Then we handle the sourcing, finding the best fit manufacturing option — including point of origin to your specs, including of course, a Made in America option. And we will help guide you on the tradeoffs between cost, quality and speed. With 3D CAD Design, PartWorks helps you quickly design a part from scratch or redesign an existing part to take advantage of 3D printing or other new manufacturing technologies, speed up product development, reduce manufacturing costs, and improve product quality and reliability. We apply our 3D CAD capabilities across a wide range of industries and applications including movie production, energy, medical, aerospace & defense, automotive, and industrial. Learn more about leveraging PartWorks’ 3D CAD design capabilities. Contact us today to discuss your needs or request a quote.